The new White House budget threatens to cancel NASA's flagship mission. The new White House budget proposal is calling for the cancellation of the Wide Field Infrared Survey Telescope (WFIRST). 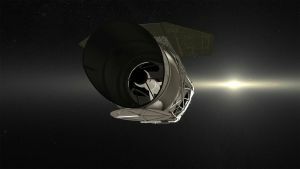 The WFIRST Space Telescope is a mission concept that aims to help scientists detect exoplanets, explore dark energy, and find answers to many of life’s mysteries. Some think that the threat of cancellation is a sharp message to the WFIRST mission leaders to reduce operational costs. However, if this does lead to the cancellation of the WFIRST, it could be a devastating blow to the global astrophysics community, and to progress on the whole. WFIRST was set to become NASA’s next flagship mission, with a tentative launch set for 2020. It was scheduled to join the ranks of other large-scale flagship missions like the upcoming James Webb Space Telescope, the Hubble Space Telescope, and more. The WFIRST would not only aid in the discovery and exploration of planets orbiting other stars in far-off systems; its foray into studying dark energy separates it from other leading telescopes. The WFIRST could allow scientists to answer a host of questions that remain astronomical uncertainties: “What is driving the acceleration of the universe? What are the properties of exoplanet atmospheres? How did our galaxy and its neighbors form and evolve? What determines the architecture of exoplanets? US should be leading the world in addressing these big questions,” posed David Spergel, a physicist at Princeton University and the co-chair of the WFIRST science team, on Twitter. What is driving the acceleration of the universe? What are the properties of exoplanet atmospheres? How did our galaxy and its neighbors form and evolve? What determines the architecture of exoplanets? US should be leading the world in addressing these big questions. In the 2010 decadal survey, a survey put out every 10 years by the National Academy of Sciences to guide funding and priorities, the WFIRST mission was listed as the top mission priority. This is true not just for U.S. astronomy, but also for the whole astrophysics community. Without the WFIRST mission, astronomers and astrophysicists might not have access to such tools at all. This move may just be a financial threat. Yet whether or not WFIRST is actually cancelled, it seems to be a concerning display of the White House’s regard towards progress in the astronomical sector.